Restaurants have long suffered from slim margins and too-often empty dining rooms. So tech companies are stepping in to match those empty seats with needy customers looking for something other than a bite to eat. As the “New York Post” reports, people are now able to use phone apps to rent out restaurant dining rooms, coat-check areas, and even bathrooms, providing operators with some easy extra cash. Apps like Luluapp, which will connect those in desperate need of a restroom with the nearest available restroom, for a fee. The app says it has already signed up more than 100 New York restaurants and bars ahead of its summer launch. Users can pay anywhere between 99 cents and $5 for a restroom and restaurants receive 65% of the fee. Bagbnb is a Rome-based luggage storage startup that works with bars and restaurants across the globe to rent out coat checks so vistors can leave their bags behind while roaming the city. The app splits its $6, per-bag fee with restaurants and has expanded by offering commissions to tour operators, Airbnb hosts and hotels for suggesting its services to their lodgers. A Penn Station restaurant, Pennsylvania 6, pulls in about $2,000 a month from storing people’s bags for a few hours or for the day, according to manager Chelsea Feldcher. She adds that about 25 percent of those customers end up grabbing a drink or meal at the eatery before they catch their train. 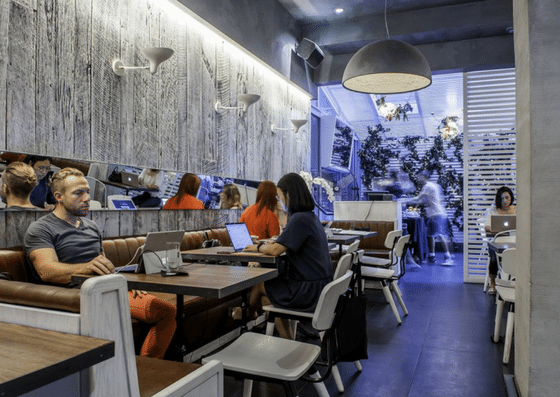 And KettleSpace, a six-month-old startup, has inked about half a dozen deals with restaurants and bars to open their dining rooms to freelancers and entrepreneurs during the off hours. It charges its laptop-toting clientele from $25 for 10 hours to $99 a month for unlimited access to use the restaurant spaces, where free coffee, snacks, and meals are sometimes part of the deal. By comparison, WeWork’s least expensive plan in New York costs $220 a month. “It’s newfound money for us,” said nightclub owner Ravi Patel, whose Hotel Chantelle recently opened up its rooftop lounge — and its retractable roof — to KettleSpace workers. “This has the potential to reach $3,000 to $5,000 a week for us, which could slash my rent by up to 30 percent,” Patel said.